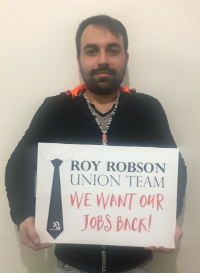 We launched a major new campaign in support of workers in Turkey who are being sacked for joining a trade union by a German clothing business, Roy Robson. After less than a week online, the campaign appears in 15 languages and has 5,853 supporters. One of our German supporters received an interesting reply from the company, which he shared with us — and which we shared with IndustriALL, whose campaign this is. Meanwhile, the company has attempted to block our messages, but we retain the option of a petition version, which we will deliver to them, even if they’re not letting individual messages through by email. We publicised on social media the fact that they were trying to block us. The Georgia campaign which we launched just three weeks ago continues to grow. It’s now up to 5,983 supporters in 19 languages. Over 400 of those supporters were responding to the Georgian language version of the campaign. We re-discovered a problem with this campaign and have noted to avoid it in future: sometimes, when the default message text is long, we need to break it up into shorter paragraphs, otherwise some servers reject this and we get error messages. We also had a problem with some translations of campaigns not reaching us through the usual online form. We dealt with this by storing the translations on the server as well as sending them by email, so they are not lost. This appears to now work and we have not missed any translations since then. We’re continuing efforts to revive dormant languages, with some success. We sent out our first mailing to our Finnish list in several years, now that we have volunteer translators again for that language. We’re currently trying to get a volunteer translator for Thai. And we’re continuing with Japanese, Swedish and other languages that we had not been using for some time. Next month is the Labor Notes conference in Chicago, at which LabourStart will have a stall. Derek Blackadder is coordinating our effort there. This is an important event, which will have well over 2,000 participants. We’ve shipped over copies of our most recent book (on organising migrant workers), have prepared a special flyer and website, and are arranging for the ILO to ship over copies of their new book on improving trade union communications which includes a positive reference to LabourStart. We continue to try to recruit new subscribers to the mailing lists — this is now a regular weekly effort and includes reminders on social media, as well as the occasional pop-up window on our website. Our mailing lists continue to grow. In the last couple of weeks we added 485 addresses of campaign supporters. Most of these are added to our new Georgian language list. We’re going to continue with regular (probably monthly) “explainers” — mailings to our list with 500 word articles by local experts. The first one was by Derek on the split in the Canadian trade unions. For our second one, we’re hoping for a US writer (we’ve already approached one) to explain the Janus case before the Supreme Court. Finally, in the UK, we’re being given an award this coming weekend by the Ron Todd Foundation. Ron Todd was the general secretary of the TGWU, a forerunner of today’s Unite the Union. We invited UK supporters of LabourStart to attend the event at the Marx Memorial Library in London.